Nitrile Butadiene Rubber (NBR) is a family of unsaturated copolymers of AcetoNitrile and various butadiene monomers. Its physical and chemical properties vary depending on the polymer’s composition of nitrile. NBR is generally resistant to oil, fuel, and other chemicals, so it is used in the automotive and aeronautical industry to make fuel and oil handling hoses, seals, and grommets. If Radical polymerization is done, image of polymer become like below. Please change composition and push calc. button. 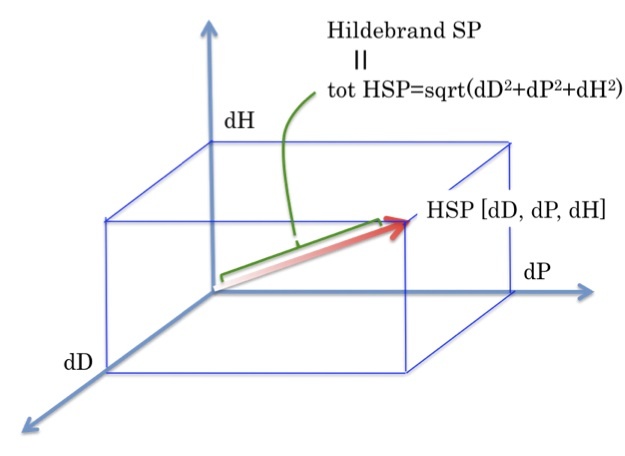 NBR Hansen Solubility Parameters were determined and listed in HSPiP database. 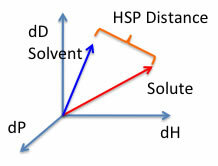 The dP value or Radius is vary depending on the polymer’s composition of Nitrile, or depending on measurement of HSP. We recommend [18.62, 8.78, 4.12] R=9.62. This time, I got a lot of swelling data for o-ring materials and re-calculated for NBR. At first, I prepared the Table. ○◎(A,B) set Score=0, △X（D,E) set Score=1. I did not use C rank solvents. And solvents (Show below) rank is not identical. So I didi not use them. With the total 151 Solvents, I ran the Sphere program and got result of [20.8, 11.3, 3.7] Radius 13.92. The total Wrong In/Out is 21 solvents. The acid solvents are not good. 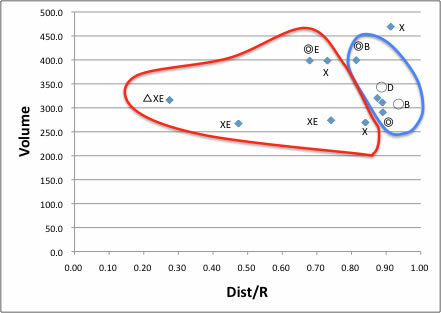 The 13 solvents that HSP distance is shorter than sphere radius, even though that will not swell NBR polymer. 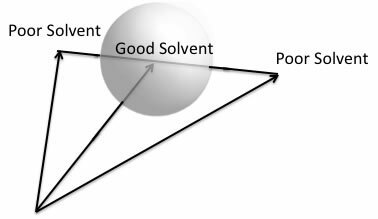 10 solvents’ molecular volume is larger than 130. 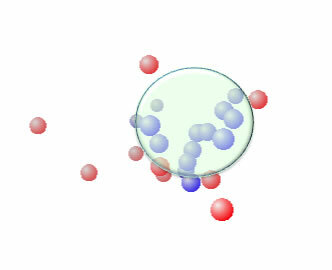 These solvents are dissolve NBR from the point of HSP, but will not dissolve from point of molecular volume. When the molecular volume become large, it is very complicated, but other case, I can understand these result more than 90% with the concept “likes dissolve likes”. I summarized the solvents that have more than 130 molecular volume in the table below. 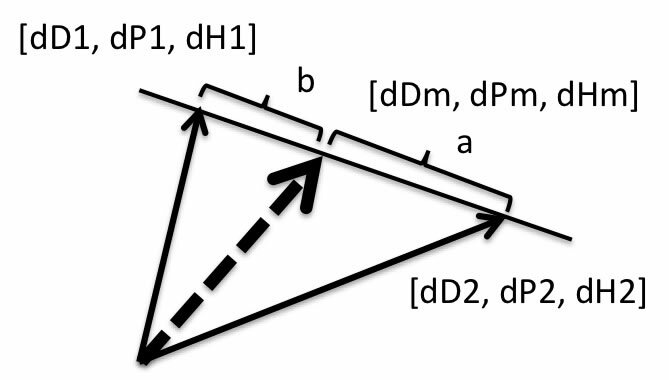 All of the distance are shorter than Sphere radius, so from the HSP point of view, NBR will dissolve or swelling. 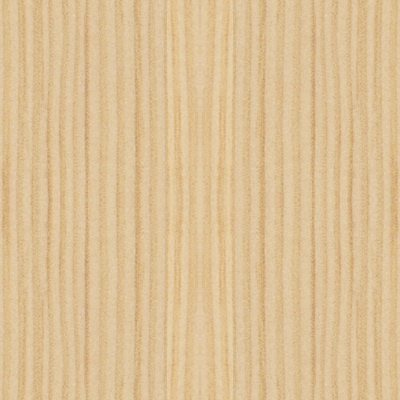 But some of them are rank ◎，◯，B, so we can use NBR for that solvents as packing. Butyl Stearate or Dioctyl Phthalate are used as Plasticizer. So these chemicals should dissolve into polymer. And play as plasticizer they should not bleed out from polymer, so molecular volume should larger than free volume of polymer. I selected plasticizers and Flame retardants from table. All of these chemicals have short distance from NBR polymer, even though the molecular volume is larger than 250. Some can use for NBR (◎，◯，B) -> blue region. Some can not use for NBR(X, E) -> red region. Almost all trend of developing plasticizers or Flame retardants are modify chemicals larger. But, the Index of Dist/R can suggest other way. 0.80< Dist/R <1.0 with intermediate volume is other choice, I believe. Data of Seals Eastern, I got swelling data for NBR. 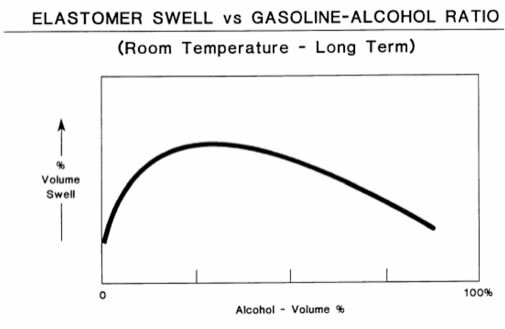 With Gasoline-Alcohol co-solvents, NBR will swelling well, even though individual solvents will not swell. 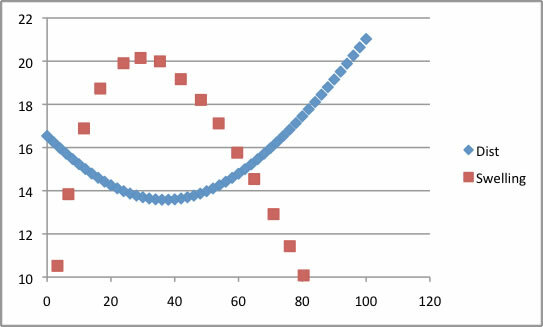 I calculated Gasoline-Ethanol mixture of HSP and plot the Distance from NBR and Swelling %. We can easily understand why this co-solvents swell NBR.